Are you the creative kind and want to surprise someone special with an exquisite, and unique baby gift? 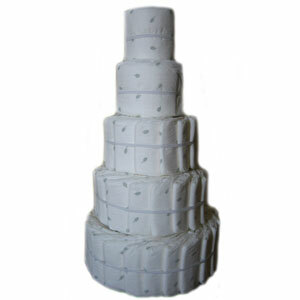 Then this Undecorated, Do-It-Yourself, Eco Friendly Diaper Cake is the perfect choice for you. Our 5 Tier Diaper Cake will surely be the center of attention at any baby shower when you add your own personal creativity and flair to the design. You will be able to create a personalized, one of a kind do-it-yourself diaper cake centerpiece that the expecting mom will appreciate and love. Add your own baby toys, ribbon, flowers, baby items and make this blank pallet a masterpiece. Let your imagination run wild, and be the talk of the party when you say "I've made this cake myself!". This Eco Friendly 5 Tier Undecorated Diaper Cake is constructed with 90-100 Nature BabyCare Eco friendly Diapers (Size 1) and is secured with white ribbon.